GarKenyon employees have over 100 years of combined experience in assembling and testing hydraulic and pneumatic aircraft components. Using a lean, modular, work cell, type production process, product flows from Assembly to Production Test for high throughput. Production hardware is assembled using Aerospace practices to assure the highest standards of quality, life, reliability and durability. All assembly conducted onsite to ensure conformance with relevant internal and external standards. Assembly department is isolated to maintain a high cleanliness level. 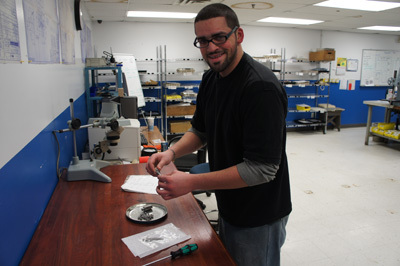 Assembly technicians are cross-trained throughout all product lines. All products are 100% tested in accordance with approved procedures prior to shipment. Our test facility has sufficient capacity to allow test standard conversion to additional fluids as required.